There is a huge problem in movie marketing these days. Studios are vying for the huge audiences and trying to get everyone to see their movie so have started to “spoil” their own films. Trailers and posters are giving away major plot points, surprises or even the ending of movies in an attempt to put people in the cinema seats. This is having the opposite effect on the movie themselves though – in some cases actually damaging the audiences appreciation. More recent examples can be found in Terminator Genisys, giving away a huge plot point central to the film or even more recently Batman V Superman, showing not only Wonder Woman but also the major villain for the whole movie. People are going in knowing too much so come out dejected when the movie offers very little that is new. Did we need to know Wonder Woman was in Batman V Superman? The Cloverfield series has managed to buck this trend. Both the 2008 Cloverfield movie and spiritual sequel, 10 Cloverfield Lane, have taken a different approach to marketing their movies and it works much more effectively. It isn’t a strategy that would work for every film but it is one that puts intrigued and excited audiences into the cinema. It began with a small, simple trailer back in 2008. No title, no release date, no press release or warning. The trailer presented a stark image, one that could only intrigue and get people talking. 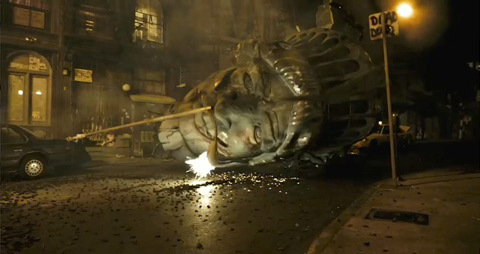 Nothing else about the movie was released, just the head of the Statue of Liberty in the street of New York. Even when trailers and posters were released, very little about the movie and it’s actual plot were given away. People were seeing slightly more than the teaser trailer told them and other than knowing a monster is terrorising New York, they knew nothing else that would happen. It worked perfectly too. It meant that people wanted to see Cloverfield because they knew so little about it. The intrigue and interest fuelled the popularity. Cloverfield learnt from their previous experience too and with 10 Cloverfield Lane, they pulled the same trick again. The movie was kept under wraps so well that it’s existence was only announced 2 months before the film was released. The same trick was pulled again for the trailer; a trailer which gave very little about the movie but ended with a great teasing scene. Yet again, interest was raised and people wanted to know more. The title itself even raised interest. Nobody had spoken about the original Cloverfield since 2008 and now a new movie, with that phrase in the title, was being released. Was it about a monster? Was it a direct sequel to the original film? Would it be Found Footage? Questions were asked and only a few of them were actually answered. When you watched 10 Cloverfield Lane, nobody would be expecting the film they saw. This marketing campaign all comes down to the movie’s producer. J.J Abrams and his studio, Bad Robot, were behind the release and subsequently marketing of the movie. Abrams has already shown his knack for clever marketing before. He is behind two of the biggest franchises of all time, Star Trek and Star Wars, and for both of those films he managed to keep the movie’s biggest secrets, plot points and surprises under-wraps, even though the furore and excitement around the movies, particularly the latter, was palpable. Overall, Abrams and Bad Robot’s approach to both the Cloverfield series and his own directorial movies, demonstrates that there is a smarter and better way to market a movie. You can cleverly get people to see the film with no spoilers, clever scene choice and teasing trailers. If only the rest of Hollywood would listen and take heed. That isn’t a bad drinking game to be honest. I am getting sick of it. It wasn’t that long ago that we had really inventive trailers too. Previous Previous post: The Views from the Sofa Podcast!